Our one-of-a-kind entertainment is guaranteed to provide a memorable experience. Our experiences are specifically designed to replace social anxiety and awkwardness with comfort, engagement, and play. Take advantage of the innovative play we provide, the social environment we create, and the experience we've gained to orchestrate it all! 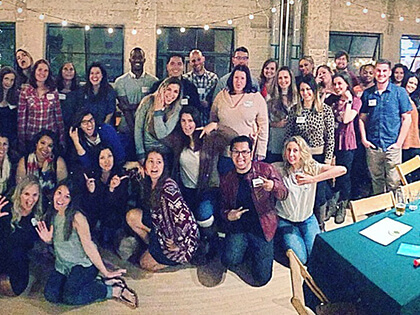 Switchboard Games is an event planning company who works with quality organizations in San Diego aiming to comfortably connect a community of 24-80 people through fun, unique, AND social experiences. Each event is specifically designed with the goal of saving organizational leadership time, energy, and money. Provide a customized experience structured from top to bottom to comfortably connect group members through the exclusive brands of social entertainment we create, organize, host, MC, and provide. We do the heavy lifting so leadership can focus on other vital tasks and save time, energy, and money. 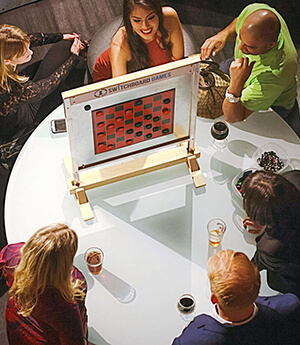 A memorable event specifically structured to use unique forms of fun and games to make sure social interactions are easy, comfortable, and engaging. To put it simply - an event designed to ensure having fun is social and being social is fun. Our unique events will increase group satisfaction, strengthen community camaraderie, showcase your appreciation, impress and entertain, retain current members, recruit new member, save you time, money, and energy, and allow you to focus on other vital tasks. We have always been infatuated with the entertainment industry. Being raised in tiny towns with little to do, a trip across the county to a movie theater was like our Super Bowl! Guess it's not too surprising we treat the business of big group fun with an incredible amount of reverence and excitement. Since we've been able to make a paycheck, we've worked hard to figure out how to provide a world-class entertainment experience at beautiful venues. During the process of enthralling millions through Movie Theater and Amusement Park management for over 14 years, we fully came to understand the power of fun and what it takes to truly entertain. Fast-forwarding to the fantastic now, we're ecstatic to have created a new concept that allows us to stay in the happiness field and seems to really resonate with those who attend. We're even more pleased to find the skills we've developed in the entertainment industry allow us to become a one-stop-shop for a social entertainment event. However, the thing we're most proud of is the fact we love what we do, the way we do it, and the simple fact we get to help connect folks along the way. All events are traditionally focused on fun OR social experiences. They're always focused on one OR the other. Is it possible to create an event concept that is fun AND social? Not only that, can you ensure that the fun is social, and the social is fun? If so, how can you remove every aspect of anxiety, awkwardness, and fear traditionally associated with meeting new people and replace them with comfort, engagement, and enthusiasm? The desire to come up with a solution for these 2 exciting questions led us to create Switchboard Games and the exclusive concept of Social Entertainment. Our name actually comes from both our passion and our quest to come up with an amazing answer– We "connect" people (like old school switchboard operators) through fun and games... Switchboard Games. Taking a page from Plato, we agree that..."You can discover more about a person in an hour of play than in a year of conversation." Curious what an event with social entertainment looks like? Wonder no more! Spoiler alert – Sooooo many laughs and big smiles. Their fun is your gain! Connect your community through our unique fun to satisfy residents and boost income! Our leadership teams have a meeting of the minds to establish exactly what you would like to get out of this event and how we can make it a reality. Our past experience as operational managers makes this step a breeze since we've seen both sides of the table and can communicate accordingly. Get the word out to your people in the best ways you know how. This can include flyer distribution, emails, newsletters, signage, etc. To make publicizing even easier, we have event signage templates you can use to ensure every marketing material is as high quality as the event itself. We'll mostly take it from here. To make sure this soiree is ideal for you and yours, we'll stay in touch to keep you in the know and ask questions if necessary. Both of these are directly in our wheelhouse due to our management positions at Movie Theaters and Amusement Parks. That said, feel free to provide assistance from your staff/community on the day of the event (allows you to save $$). No matter what, we'll be ready to greet your guests and make them feel at home throughout! Our team will stay on top of every detail to make sure scheduling, entertainment, food and beverage, vendors, etc are consistently in sync so the event goes smoothly. Onsite vs offsite events will require more or less of your assistance. This is our favorite part! It's our pleasure to make sure the smiles are big and the laughs are bigger. Whatever entertainment option is chosen, we'll create an environment full of low stress/high enjoyment childlike wonderment. We consider it our job to give you a happier, more connected community than the one you gave to us. Our socially structured formats effectively encourage people to meet through the fun we provide. Your well-run organization is amazing! You know hosting social events increases group satisfaction and creates a connected community. However, they require a lot of time, money, energy, skills, connections, and resources while taking you away from what you do best. It's our goal to give you back more of these vital resources than the amount you invest. "As a host of several single mixer groups, I am always trying to come up with new ways to help my attendees mix and mingle. 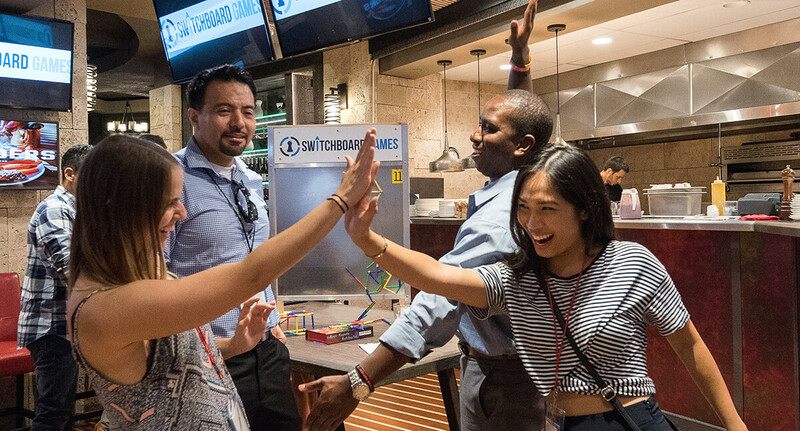 Collaborating and attending a couple games night hosted by Switchboard was the perfect way to ease the anxiety, awkwardness, and uncomfortable atmosphere mixers can have. They, also, eased the facilitation process for me as a host. I highly recommend attending their events (it's really a great way to make new connections) and if you want to host a community event, collaborate with them to see how they can help." 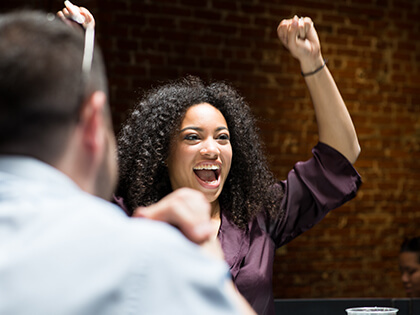 "I am a manager for a high-rise residential building and we threw a game night at a local restaurant with Ryan and Switchboard Games and my residents had an absolute blast. Ryan was an amazing host and his outside the box thinking, to create something so engaging and fun for people, really brought our residents closer and several new friendships were made. I look forward to doing this again and highly recommend using him at your next event." "Switch Board Games ignites playful creativity for young and old. Our parents and children enjoy the family friendly vertical games and encouraging services offered. This is a clever and interactive approach to board games." "Switchboard Games took our event to the next level. It added a fun, much-needed interactive element that all of our guests loved! Ryan was great to work with and I would highly recommend Switchboard Games for any event." "Switchboard Games made our church singles' event a success! We brought together 50+ people who didn't know each other, played Switchboard Games for a couple hours and by the end of the night, everyone was friends with everyone. Ryan and his team made the whole evening so simple for us; they booked the venue, set up everything and customized the games specifically for our group. I would highly recommend Switchboard Games for any group that is looking to build community quickly and naturally in a stress-free setting." "Switchboard Games is synonymous with “guaranteed fun”! They take great care in organizing their events and insuring everyone is involved and having a wonderful time. The concept of taking classic games and making them vertical is genius! The set up is perfect for an all inclusive group interaction and keeps the games safe from food or drink spillage. 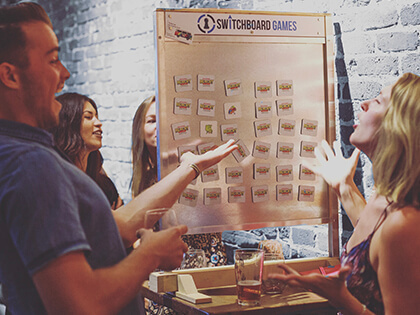 Switchboard Games really takes networking and social events to the next level!" "Our brewery had a 1 year anniversary party and switchboard games was an incredible addition. 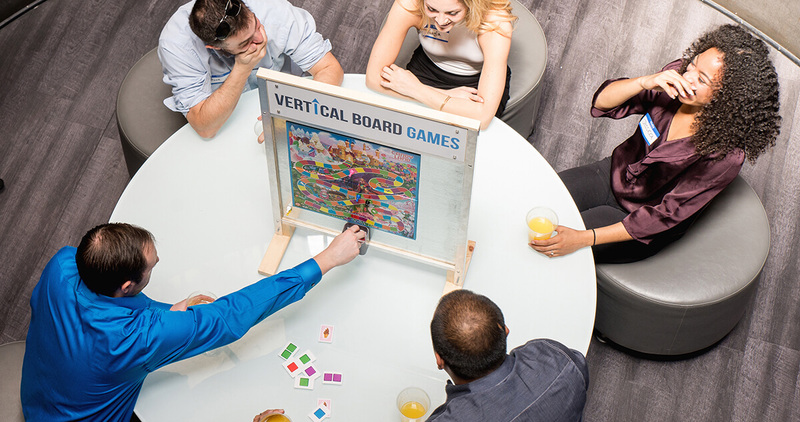 We were not sure how our normal clientele would receive the vertical games but everyone LOVED them! It was a great social and casual, fun activity to do at our brewery and complimented our party perfectly. I would highly recommend at least trying it out, you would be surprised how much people love them. Ryan was so easy to work with. He was responsive and timely and very personable. Overall, great service, great experience, and we would definitely use them again for a future event." 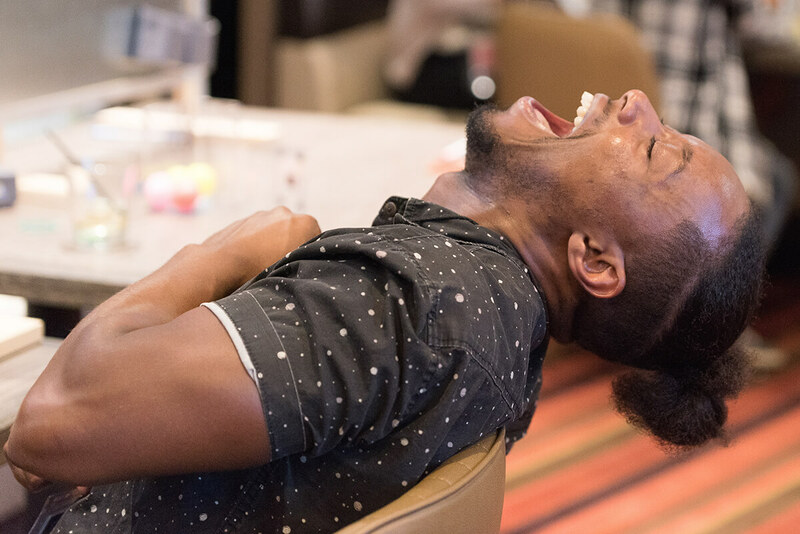 "I've thrown many events throughout multiple venues in San Diego and every time I added Switchboard Games, it elevated the event to another level. Seeing guests smile constantly and having fun by bringing them back to classic games; made these events more entertaining and enjoyable for everyone. These games are an automatic ice-breaker, comfortably making even the shyest of guest a social butterfly. I never question utilizing Switchboard Games at every opportunity." 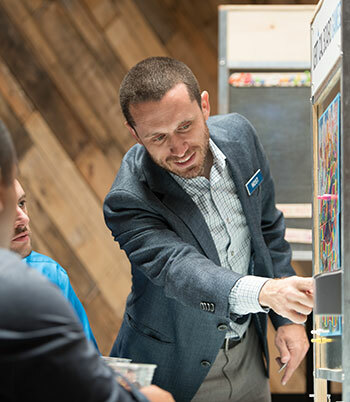 We believe in high quality connections, not high-pressure sales. If you have any questions, comments, or requests, we’d love to hear from you.